Usually there are French toast people and then there are pancake people. If you happen to be strictly among the pancake lovers I have the recipe to change your mind. When it comes to making good French toast there are two very important factors. The first is good bread, cinnamon-raisin in my book is the best. As the bread cooks, the filling gets all melty and gooey, it makes all the difference in the world. The second is the custard, I was told once that just plain French toast could be delicious without syrup. Shocking I know, but if you have a good egg mixture to soak your bread in, you won’t even need syrup. 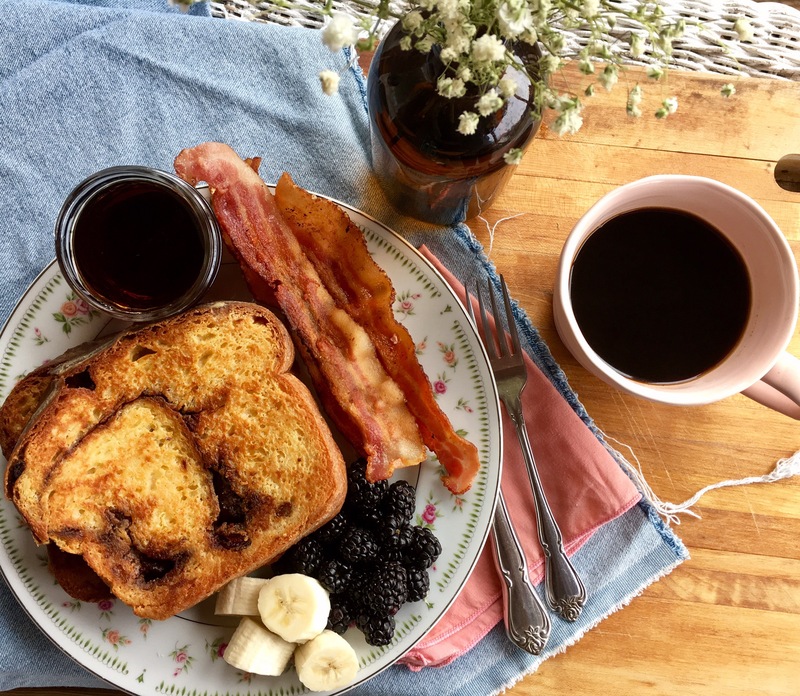 French toast is way simpler to whip up than pancakes. So this weekend you can enjoy a delicious, yet simple breakfast right from home. 1)Forget the egg whites, just egg yolks in this recipe. If you don’t have heavy cream you can use half & half instead. 2)Slice the bread in thick slices. If you cut them too thin it will just fall apart. 3)I’ve only made my French toast with homemade cinnamon-raisin bread, but store-bought is definitely fine. But if you decide to make some homemade bread it keeps great in the freezer. Just pull it out whenever you get the craving. Preheat oven to 350 degrees F. and place a cooling rack on a baking sheet and place in the oven. In a shallow dish (like a pie dish) whisk together all the ingredients except for the bread 😝. Over medium heat melt one Tablespoon of butter in a skillet. Place a slice of bread in the egg mixture and allow it to soak on each side for about 1 minute. I cook mine for about 6 minutes each side. Once the french toast is cooked, place it in the oven to keep warm. Continue with the remaining slices of bread. Serve the french toast with powdered sugar or syrup. Enjoy!